Two days ago, I posted about pro-abort feminists throwing fire bombs at a church in Trelew, Argentina last Sunday night. Firebombing of church has come to America. 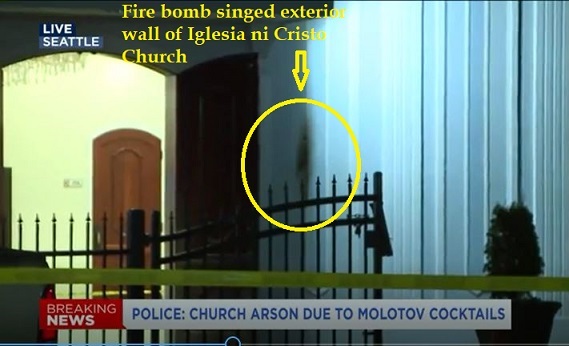 Q13 Fox reports that just after 8 p.m. last night, Oct. 18, someone threw Molotov cocktails at the Iglesia ni Cristo Church at 7100 42nd Avenue South, Seattle, Washington. About fifty people were worshiping inside the church. Fortunately, no one was injured. Witnesses called 911 to report a fire outside the church. By the time the Seattle Fire Department arrived, the fire had already been extinguished. Witnesses said a person had thrown lit bottles of an unknown liquid at the building. Seattle Fire spokesman Kristin Tinsley said the fire was started by several Molotov cocktail devices, which caused minor damage to the exterior of the church and some vehicles outside. Below is a video from a surveillance camera across the street from the church, showing several Molotov cocktails exploding against the front of the church. Seattle Police Arson/Bomb Squad detectives have taken over the investigation and are working with witnesses to develop a suspect description. Q13 Fox reporter John Hopperstadt tweeted that church members said they had “confronted” a group of men outside the church a few days before the arson. Iglesia Ni Cristo is an independent nontrinitarian Christian religious organization that originated in the Philippines. It claims to be the one true church and the restoration of the original church founded by Jesus, and that all other Christian churches are apostates. According to the 2010 census, 2.45% of the population in the Philippines are affiliated with the Iglesia ni Cristo, making it that country’s third largest religion, after Islam at 5.57% and Roman Catholicism at 80.58%. This entry was posted in Uncategorized and tagged Iglesia ni Cristo Church in Seattle. Bookmark the permalink. I’m about halfway between the terrorists of Seattle/Portland and the kooks and freaks of ‘Francisco and recently a couple of ex-felons were picked up, (close to my neighborhood), for possession of a pipe bomb and other felony charges. I don’t know if I should start carrying more guns or bigger guns. Get ready this is just the beginning it will get increasingly worse before it gets better. It will take them doing something so bad it makes the whole country stand up against it, but there will be many causalities before it happens. We will be the ones standing in the gap when the time comes, thanks Doc for this post people need to know. Seems the spiritual world is stirring up more of a fight to stifle the truth than ever before. Maybe someone was trying to kill a child molester lol. Hope they catch the bastards. This horrendous attack may not be Soros-financed or Soros-sponsored, but it is, even from an indirect level, Soros-inspired: The violence of ANTIFA has been spawning spinoff violence. I’m asking this here because of the other article mentioned in this one, i.e. Pro-aborts firebombing a church in Argentina. Have y’all seen the reports of large numbers of dead babies being found in funeral homes in Detroit? Are they running abortion mills from funeral homes now? Selling organs maybe? It’s the stuff of nightmares! Is it fair to call a “non-trinitarian” group “Christian”? “Non-trinitarian” and “Christian” are mutually exclusive. INC is, quite simply, Satan worship.